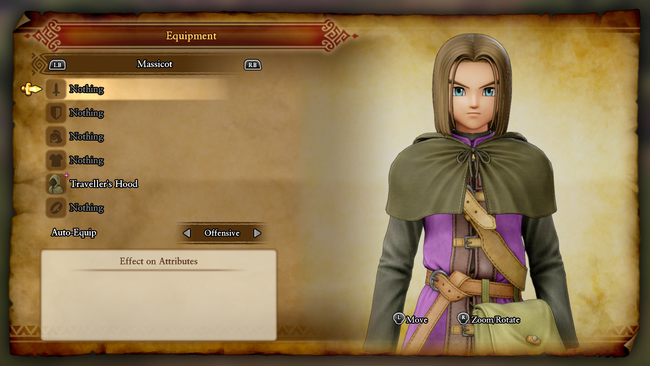 The 'Dedicated Follower of Fashion' trophy is arguably the most time consuming of all of the ones available in Dragon Quest XI: Echoes of an Elusive Age. Not only are some costumes hidden away behind side quests, but many of them also have to be crafted on top of acquiring their recipes. Not only do the costumes alter the look of your party members, but they also offer some unique stats and bonuses, and the final costume for each party member effectively serves as their best gear. We've got them all listed out by character and show you how to acquire each and every one of them. Note that all cosmetic gear must be acquired to unlock the trophy, including armor sets that look the same, accessories, and upgrading the Trodain gear. In order to obtain the materials necessary to craft many of the game's costumes, you'll need a lot of gold on hand, so be sure to check out our guide on How to Earn Gold Quickly in Dragon Quest XI. Also be sure to check out the Best Weapons and Armor in Dragon Quest XI. 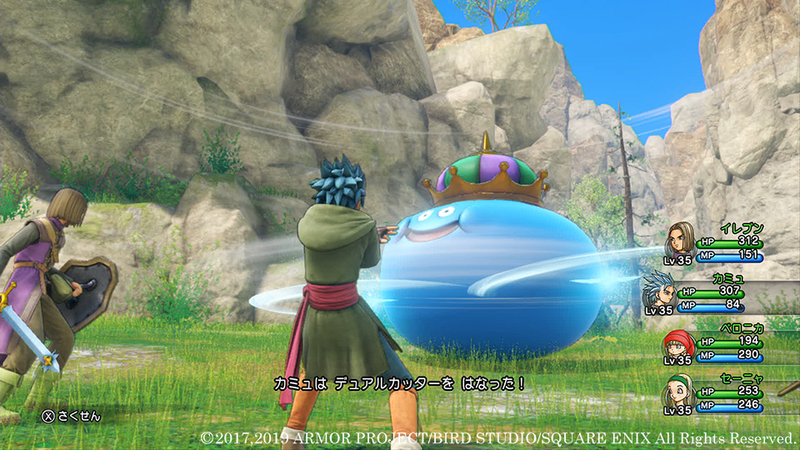 Note that this list will have spoilers for certain elements of the story in Dragon Quest XI. Traveller's Hood: Find this in a cabinet in Gallopolis' church. This is an accessory that will put on the story-hood cosmetic, provided you aren't equipped with another costume. 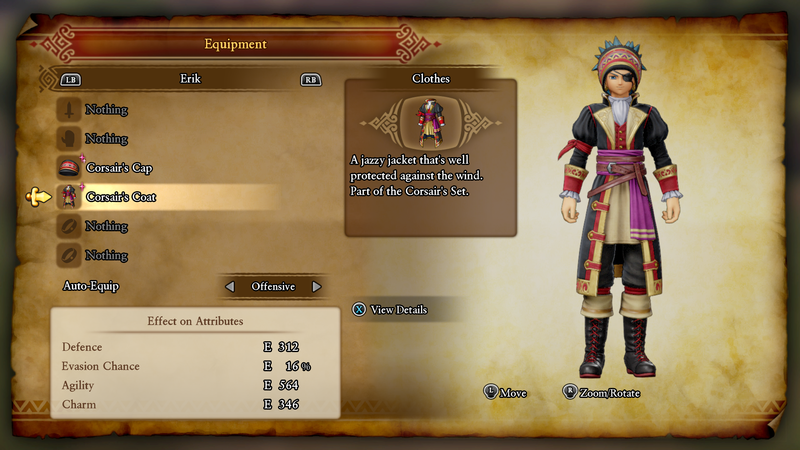 Gallopitan Garb: Win this for getting in first place at the Gallopolis Horse Racing mini game's Silver Cup on easy. Drasilian Helm and Drasilian Armour: Craft this material using the Recipe Book: Dress Like a Drasilian, found in the Ruins of Dundrasil. 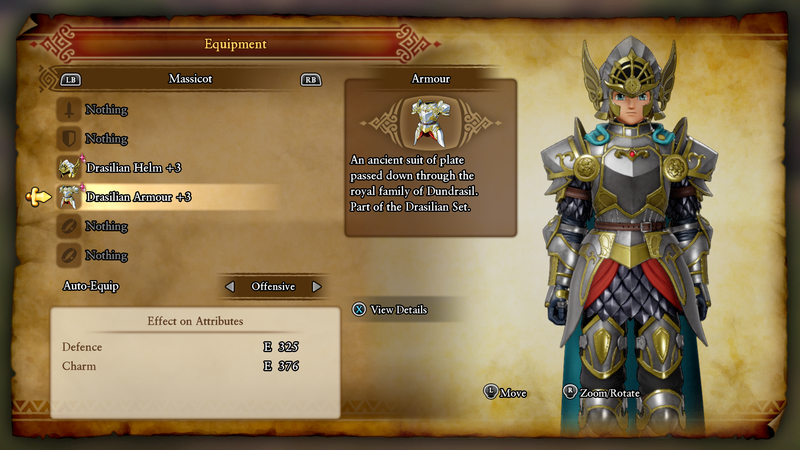 Crafting the set will require Platinum/Gold Ore and some Glass Frit and a Celestial Skein, which can both be bought at Warrior's Rest. 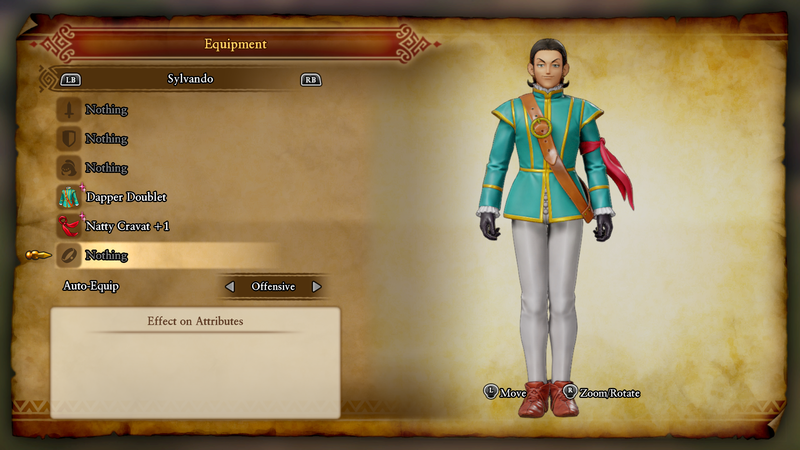 Mardi Garb: Acquired through story progression when you reunite with Sylvando after the events at Yggdrasil. Cobblestone Clobber: Found in the Hero's house in Cobblestone during the Post-Game. 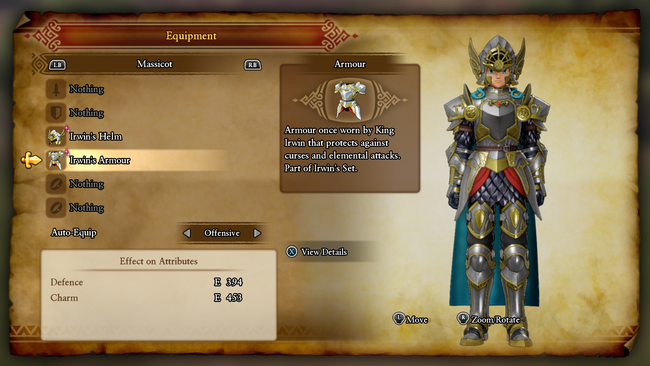 Irwin's Helm and Armour: Rewarded for completing the Post-Game events at the Ruins of Dundrasil. 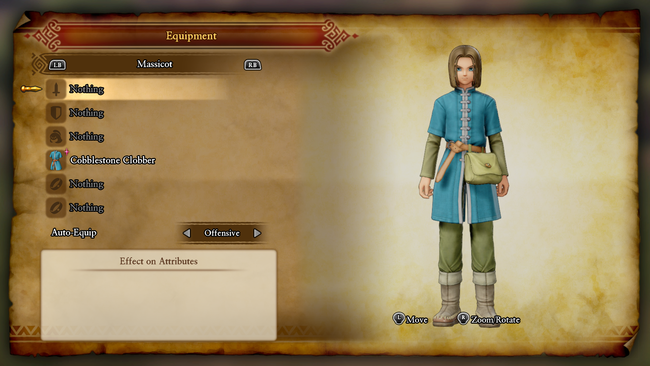 Looks the same as the Drasilian gear, but with better stats. 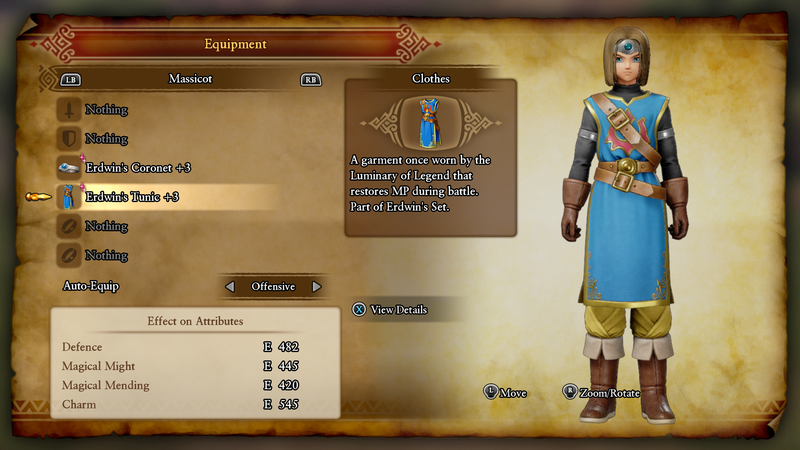 Erdwin's Coronet and Tunic: Both are found in the Luminary's Trial during the Post-Game. The Coronet is found on the 3rd floor, and the Tunic is found behind the red-sealed gate on the first floor, which you can unlock right before exiting to the Vault. Artisanal Trodain Bandana and Togs: Upgrade the gear of the Dragon Quest VIII Hero using the Recipe Book: Trodain's Top Trends, which you'll start with. You'll need a Pep Pop and a Kaleidocloth to upgrade each. 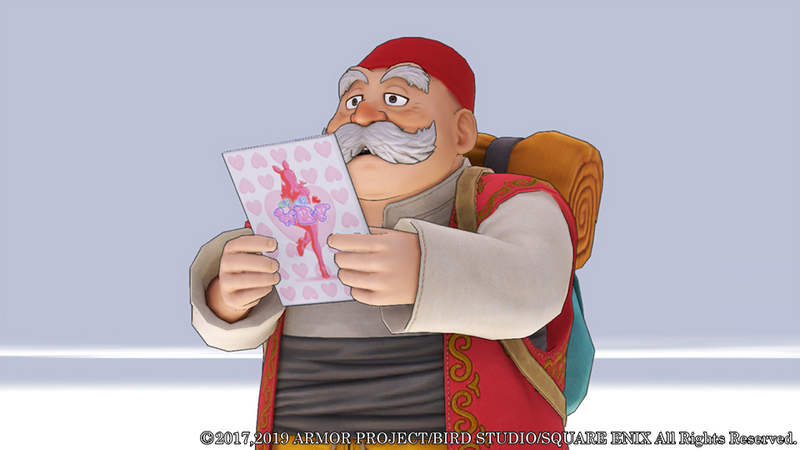 You get two "free" Pep Pops, one for completing the quest 'Mistress Bev’s Perfect Prediction', and one found in the Luminary's Trial. You can also buy them for 200,000 from the rebuilt shop at Cobblestone in the Post-Game. Swindler's Scarf and Stole: Crafted using the Recipe Book: Sweet Stuff for Swindlers, rewarded from completing the Quest 'Shiver Me Timbers'. Note that the Stole can also be worn on its own. You'll need Faerie Fluff, Cottontop, Blue Eye, and Maiden's Favour. Faerie Fluff and Maiden's Favour can be bought at Puerto Valor, Cottontop at the Emerald Coast campsite, and Blue Eye from the Academe. Corsair's Cap and Coat: The Cap will drop from the Gyldenbritches boss as part of the story, and you can buy the Coat from the Nautica Weapon/Armor Shop once you're able to transform into a fish at will. Note that the Coat can also be worn on its own. Swindler King's Scarf and Stole: Similar to the base costume, this is a crafted set. Can be crafted using the Recipe Book: King of the Swindlers, which is found in the Heliodor Prison behind an Ultimate Key door. You'll need Technicolour Dreamcloth, Gold Nuglet, Royal Ruby and Savvy Sapphire, Mythril Ore, and Slipweed. 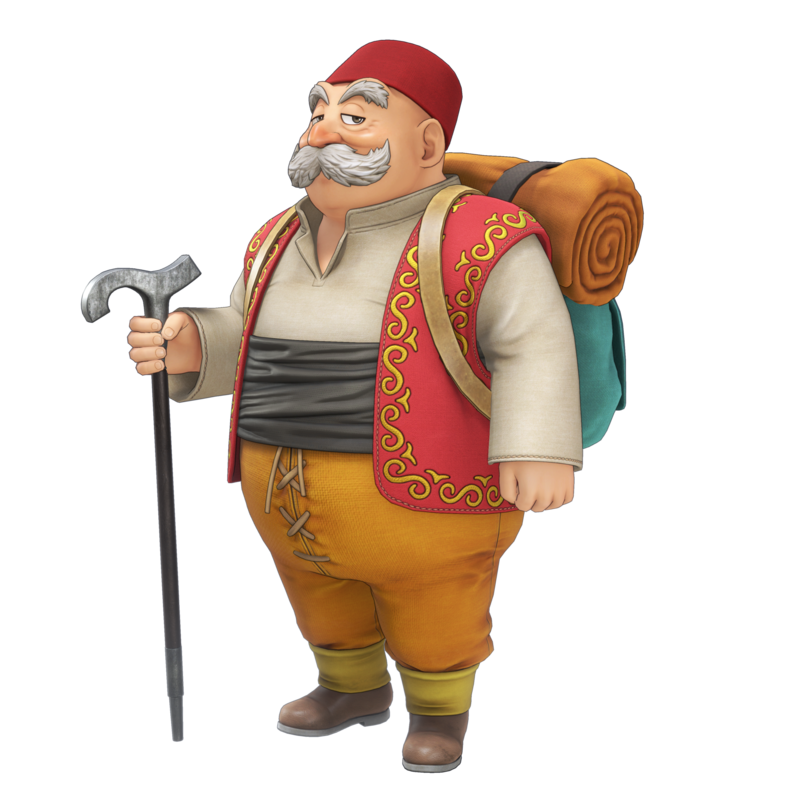 The first two can be bought at the Trial Island, the gemstones from the Academie, and the Slipweed from the Snaerfelt Campsite. Pirate King's Cap and Coat: An upgraded form of the Corsair set. 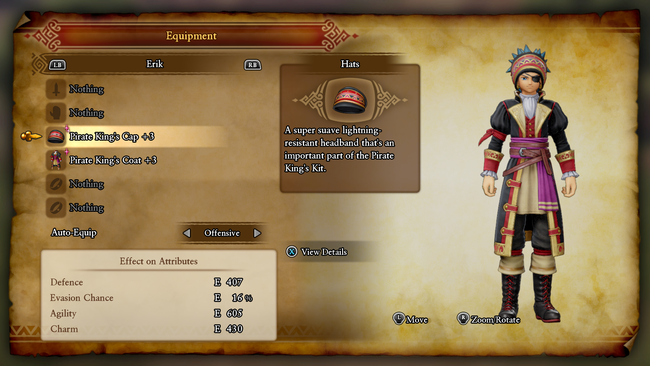 Receive the cap from the chieftain after completing the Post-Game events in Lonalulu. The Coat has to be bought in Cobblestone once it's rebuilt. Cat Hat and Suit: Purchase the hat from the armor shop in Gondolia. 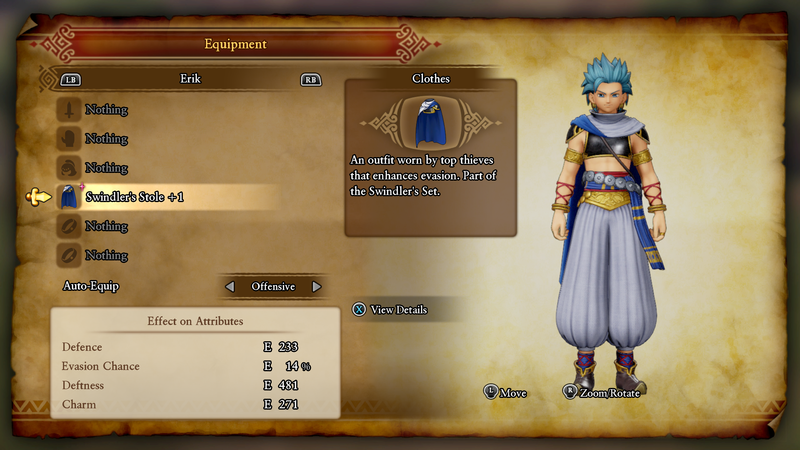 As for the Suit, you can either get it from the shop stalls in Gondolia early on in the game where you can haggle the price down between two brothers, or simply buy it from Gondolia's armor shop after the Yggdrasil events. 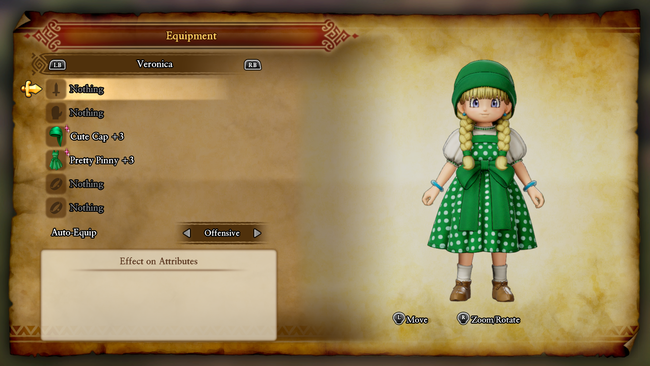 Cute Cap and Pretty Pinny: Both are crafted from the Recipe Book: All Things Nice, received from a red-clothed townsperson in Puerto Valor. He can be found either near the entrance of town, or at a second-floor balcony near the hotel. You'll need Faerie Fluff, Cottontop, and Waveweed, which can be found at the shops at Puerto Valor and at the Emerald Coast campsite. 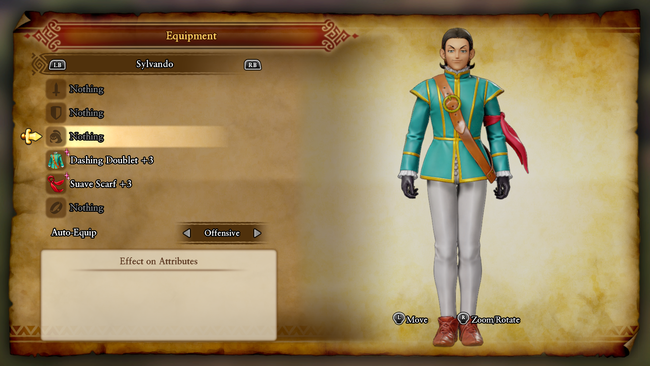 Uniform de l'Academie: One of these is rewarded for turning in 25 Mini Medals to the Academie, one is found in a chest behind a Magic Key door at the Academie, and a third is the reward for completing the Quest 'The Agony and the Ecstasy'. Stellar Starflower and Suit: After the Post-Game events at Octagonia, head up to the Casino and speak to Sinderella and Whambelina to easily earn these two armor pieces. Kaleidocloth: Trade Serpent Soul's with Krystalinda at the Sniflheim Castle. 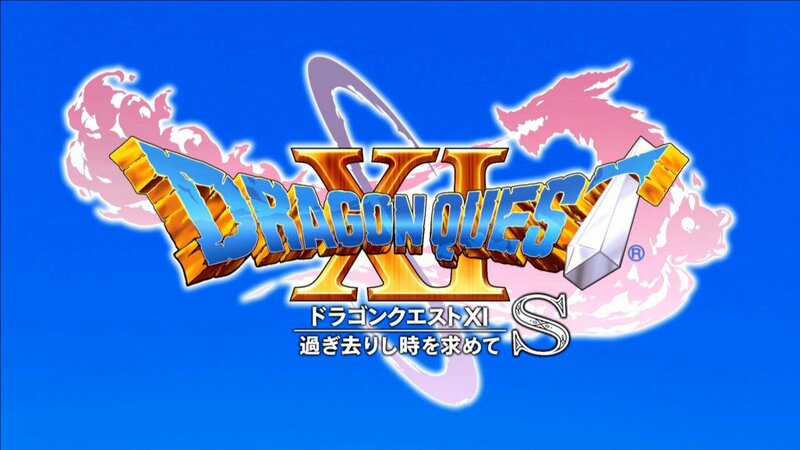 Steal Serpent Souls from Royal Reptiles at the Ruins of Dundrasil, or from other late game dragon type enemies. Cumulonimbough: Steal from Malicious Fruity Succubats in the First Forest. 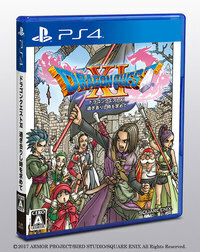 Chronocrystal: Purchase at Cobblestone once it is rebuilt. Red Wood: Steal from Malicious Stump Champ in the First Forest. Permasnow: Found in sparkly points all over Sniflheim and Snaerfelt. Pale Pearl: Purchase at the stall to the left just as you enter Lonalulu. Dancer's Costume: Simply buy this at the Gallopolis armor shop. Bonny Band and Dainty Dress: Both are crafted from the Recipe Book: All Things Nice, received from a red-clothed townsperson in Puerto Valor. 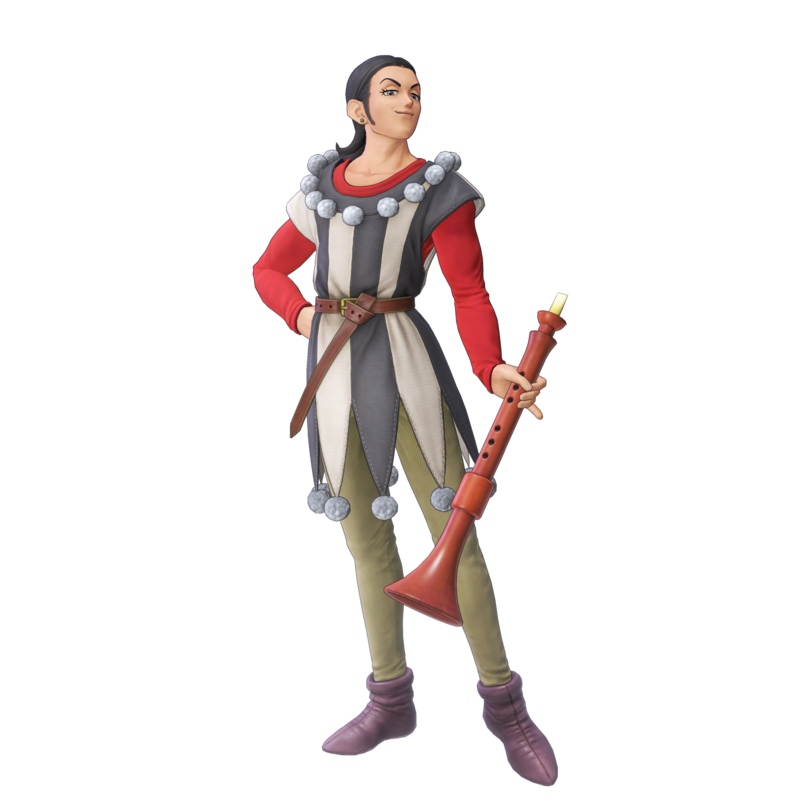 He can be found either near the entrance of town, or at a second-floor balcony near the hotel. You'll need Faerie Fluff, Buzzberries, Waveweed, and Crimson Coral. Stop buy the Costa Valor and Emerald Coast campsites and the shop at Puerto Valor to find all the ingredients. Colourful Cocoon: Can be bought at either Haven's Above or Trial Island. Pale Pearl: Purchase from the stall to the left of the entrance to Lonalulu. Mirrorstone: Purchase at Snaerfelt Camp. Sainted Soma: Can trade for 30,000 tokens at the Puerto Valor casino. 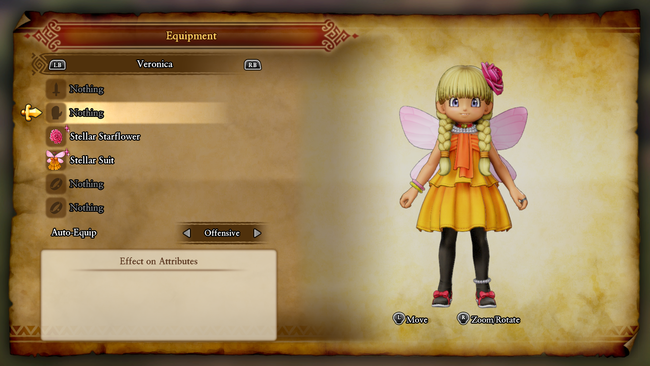 Can also steal from the gold statue enemies found in the Ruins of Dundrasil area during rainy days. Molten Globules: Can trade for 20,000 tokens at the Octagonia casino. Savvy Sapphire: Purchase at the Academie. Brighten Rock: Purchase at Snaerfelt Camp. Sparkly Sap: Purchase at the Academie. Technicolour Dreamcloth: Purchase from the shop at Trial Island. Slime Crown: You should get plenty of these from quest rewards, drops, and looted chests, but an infinite supply can always be traded for 50,000 tokens at the Octogonia casino. 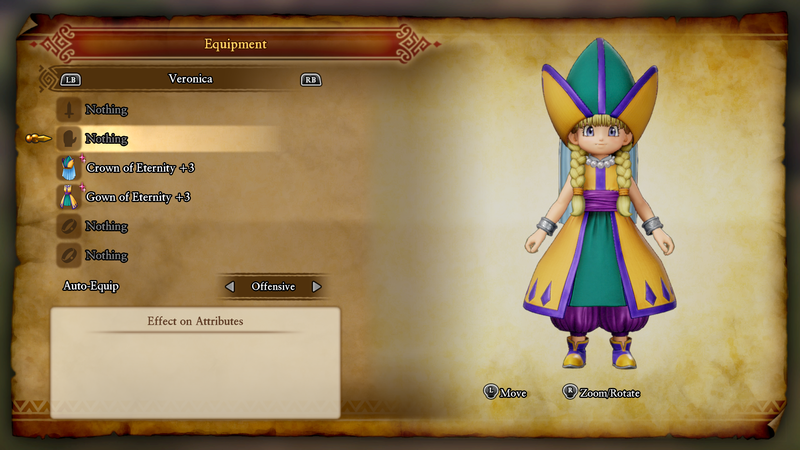 Serenica's Circlet and Surplice: These are both found in chests in the Trial areas: the Circlet can be found in the Fierce Forest area of the Sage's Trial, and the Surplice can be found in the Luminary's Trial, on the first floor behind the red-sealed door. 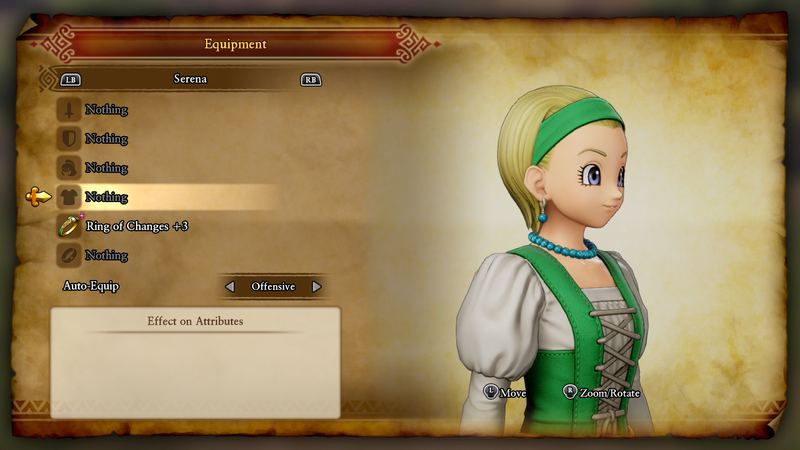 Ring of Changes: Once you reach the Vault after clearing any trial, you can wish for Serena's option to have the shorter hairstyle. 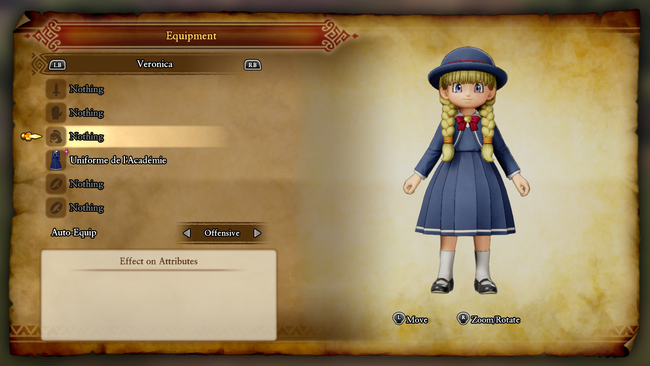 This is a pretty cool accessory that increases Serena's charm, and can be paired with any of her other costumes, effectively doubling the number of possible looks she can have. Dapper Doublet and Natty Cravat: Crafted from the Recipe Book: The Dapper Chap, which is rewarded for completing the Quest 'Skincare for the Fierce and Fabulous'. You'll need Silkblossoms, Magic Beast Hides, Green Eye, Glimmergrass and Celestial Skein. 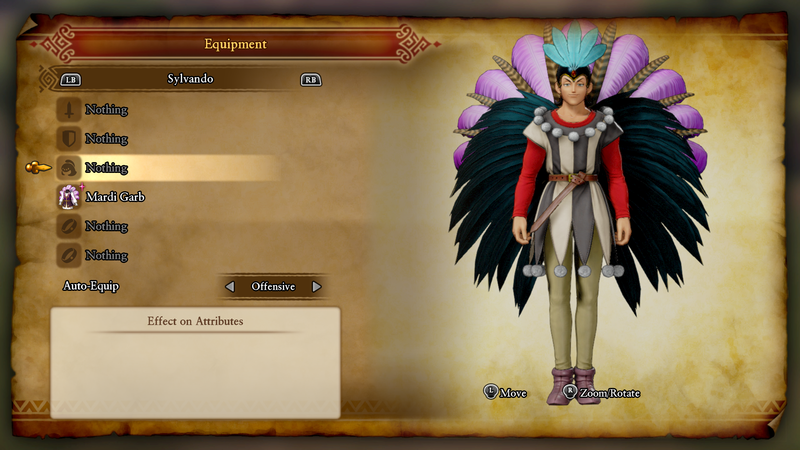 Shop around at the Academie and Dundrasil/Gondolia campsites to find the materials you'll need. Tiara Tremenda and Glad Rags: Crafted from the Recipe Book: 'Glam Gear for Go-Getters', which is rewarded for completing the Quest 'Madame Labouche's Life Lesson'. You'll need Gold Ore, Royal Ruby, Belle Caps, Slipweed, Lambswool, and Love Potions. Buy the Lambswool from Angri-La, the Slipweed from the Snaerfelt Camp, and the Rubies from the Academie. 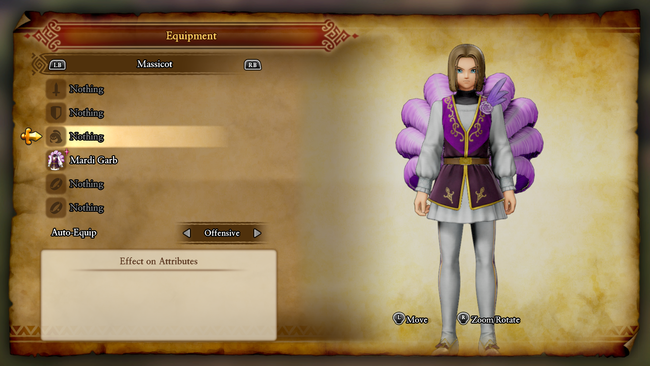 Love Potions can be traded cheaply at the Octagonia casino, and Belle Caps are abundant in Forest areas (Manglegrove, First Forest) and can be stolen from several mushroom type enemies. Dashing Doublet and Suave Scarf: An upgraded version of the Dapper Doublet set. Crafted from the Recipe Book: Dress to Impress, which is given to you after speaking to Golden Boy on the Octagonia casino stage after the Post-Game event there. You'll need a number of moderate to rare materials for this one, but they can almost all be bought from either the Trial Island or Academie shops. Buzzberries can be found on trees in the Heliodor region. 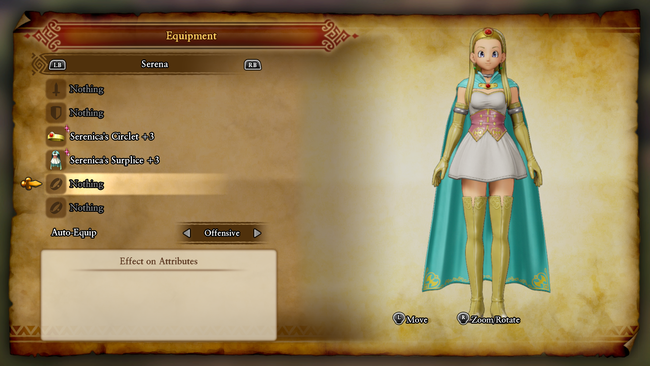 Tiara Tremendisima and Gladder Rags: An upgraded version of the Glad Rag set. Crafted from the Recipe Book: Glammer Gear for Goer-Getters, which is the reward for turning in 90 Mini Medals to the Academie. 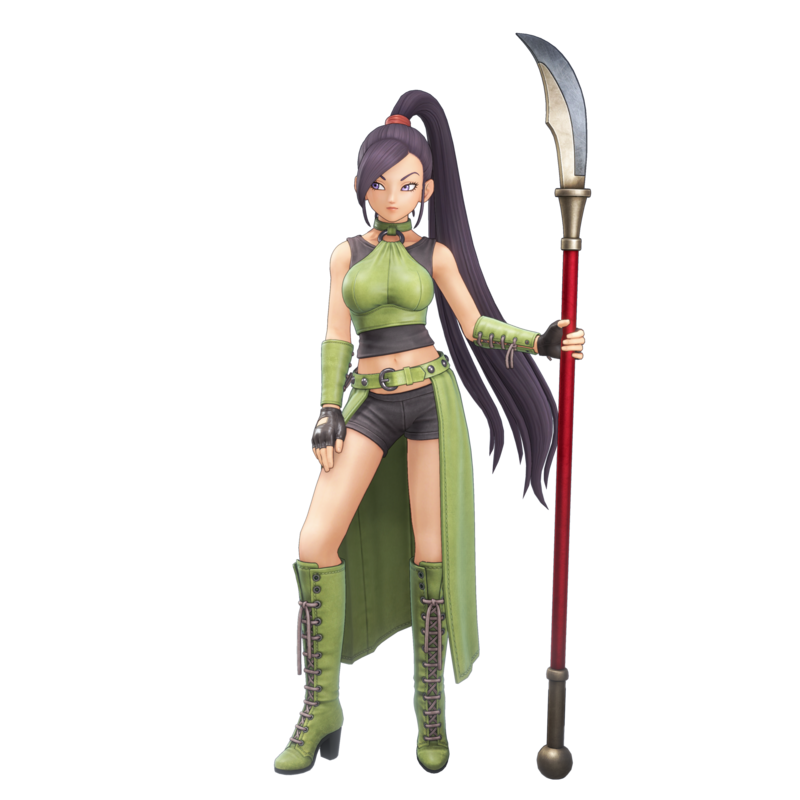 Again, pretty much everything can be bought at the Trial Island or Academie shops, along with Love Potions from Octagonia and Crimsonite/Kaleidocloths from trading Serpent Souls with Krystalinda. You can also earn Crimsonite from the final Horse Race mini-games, once you unlock it via a wish at the Vault. 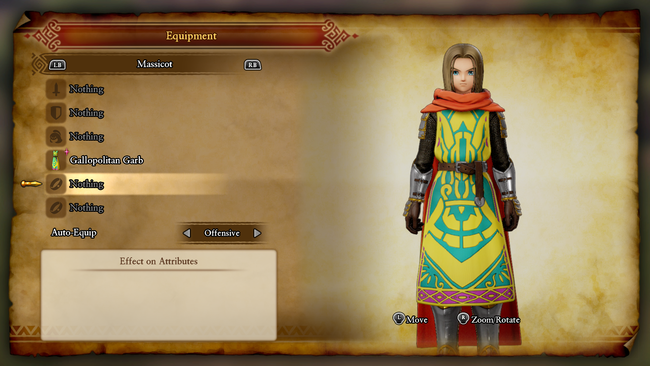 Crown of Dundrasil and Drasilian Dress Coat: A crafted set from the Recipe Book: Kit Fit for a King, which is rewarded for turning in 30 Mini Medals to the Academie. 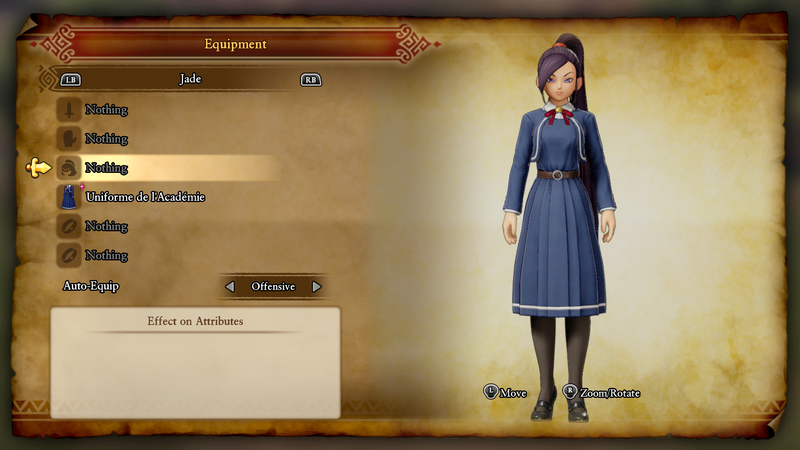 The materials needed are pretty easy to get, the Silkblossoms can be bought from Dundrasil's campsite, and the Red Eyes from the Academie. Only the Glimmergrass needs to gathered, and it's pretty abundant in many regions. Sun Crown and Pallium Regale: A crafted set built from Recipe Book: Corking Kit for Kings, which is rewarded from the Third Trial of the Wheel of Harma at Angri-La's Field of Discipline. The materials required are a little trickier to find, but you can buy the gemstones at the Academie, the Colourful Cocoons and Technicolour Dreamcloths at Trial Island. 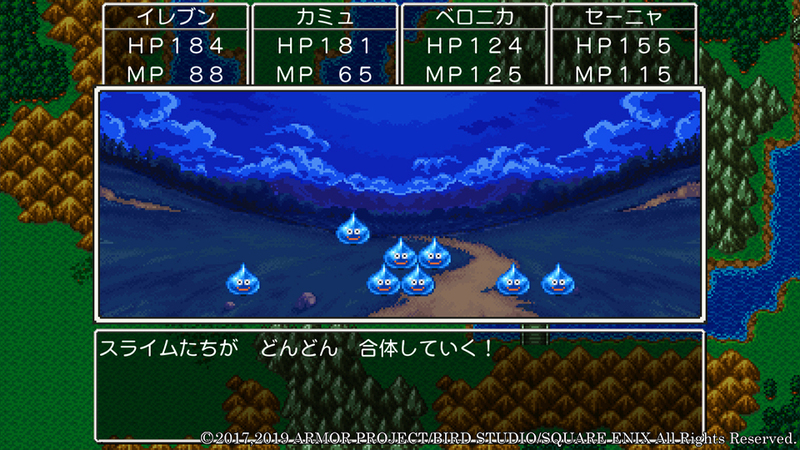 Slime Crowns and Fire Balls can both be traded at the Octogonia Casino. Yggdrasil Crown and Dress Coat: An upgraded form of the Dundrasil set, built from Recipe Book: What a Wonderful World Tree, found in a chest in the Fierce Forest area of the Sage's Trial. The materials needed for this set are mostly the same as the ones needed for the sets above, with the addition of Gold Nuglets and Bars, which can be bought at Trial Island. Kaelidocloth: Trade Serpent Souls to Krystalinda at Sniflheim's castle. Serpent Souls can be stolen from Royal Reptiles at the Ruins of Dundrasil. Spectralite: Buy at the Trial Island Shop. Uber Agate of Evolution: One of the hardest materials to get in the game, even late post-game. Either trade mini-medals at the Academie once the stamp-book is filled, or get the rare steal from Phoenix's in the Disciple's Trial buy using Pep Powers like Haulellujah. Mini medals can be farmed via the Black Horse Race mini-games at Gallopolis. Serpent Skin: Buy at Trial Island's shop. Dieamend: Found in a few late game areas as a gather point, the most reliable being the Hotto Steppe - Northern Whale Way station. Crimsonite: Either trade Serpent Souls to Krystalinda or win from the Black Horse Race mini-game at Gallopolis, once you unlock them via a wish at the Vault, after clearing a trial. 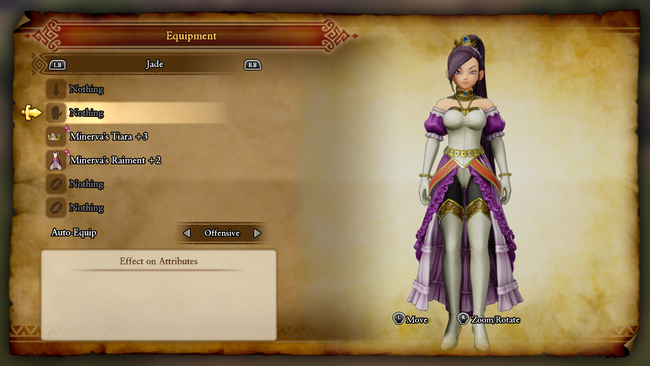 Bunny Suit Set: The Bunny Suit set is unique to Jade and requires a few steps to complete. We've outlined the process of completing this outfit here. Scandalous Swimsuit: Purchase at the Octagonia casino for 70,000 Tokens once you defeat the boss and reunite with Jade. Warrior Princess's Headdress and Dress: Crafted from the Recipe Book: Pride of the Valkyries, found in a Chest in the final dungeon of the game before the Post-Game. All of the items needed to craft the set can be bought at the Academie, Trial Island, Snaerfelt Camp, or Costa Valor camp. 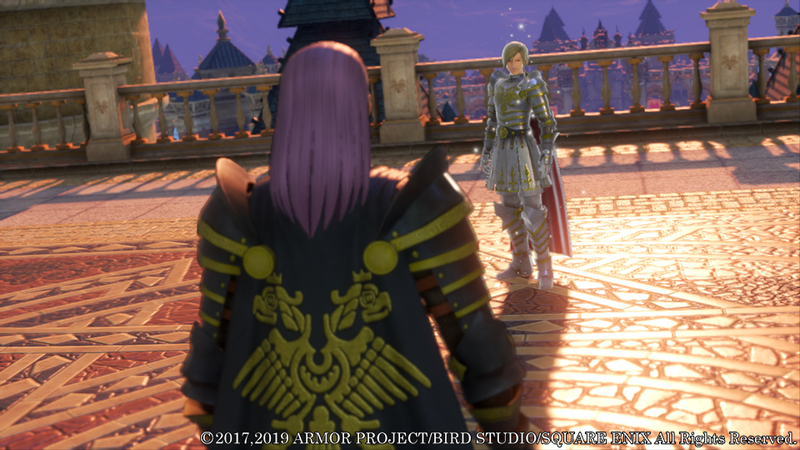 The Sainted Soma can be traded for 30,000 tokens at the Puerto Valor casino or stolen from the gold statue enemies found in the Ruins of Dundrasil area during rainy days. Divine Bustier: During the Post-Game, two shop owners on the west side of Gondolia will both offer this item for ludicrously high prices. Simply find both merchants and haggle between them until you see an offer for 20,000 gold, and then buy the armor. Minerva's Tiara and Raiment: An upgraded version of the Warrior Princess set, build from Recipe Book: The Way of the War Goddess, which is found behind an Ultimate Key door in The Battleground. Most all of the materials can be found in the same shops as for the Warrior Princess set (that is, the Academie, Trial Island, Snaerfelt Camp, Costa Valor camp, and the Puerto Valor casino.) 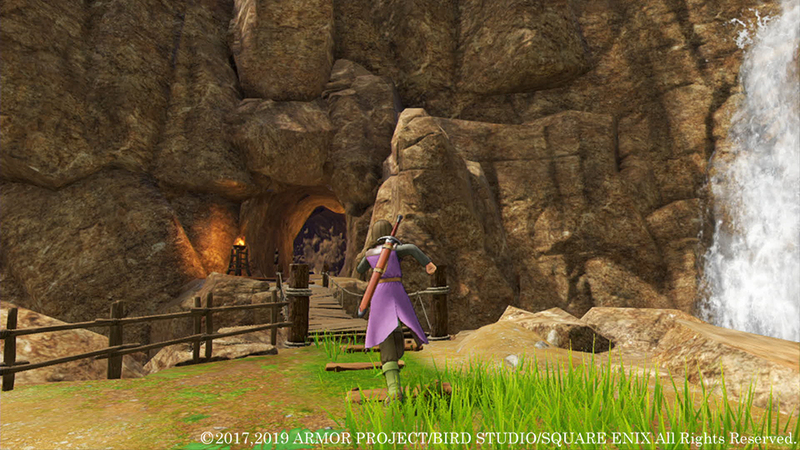 As for the Orichalcum, the most reliable source for those seems to be behind the Ultimate Key door at the Battlegrounds, the same location you found the recipe. Hot Bikini: During the Post-Game. return to the Octagonia casino and trade 150,000 for the upgraded version of the Swimsuit. Serpent Skin: Buy this at the Trial Island shop. Kaleidocloth: Trade Serpent Souls to Krystalinda at Sniflheim's castle. Serpent Souls can be stolen from Royal Reptiles at the Ruins of Dundrasil. 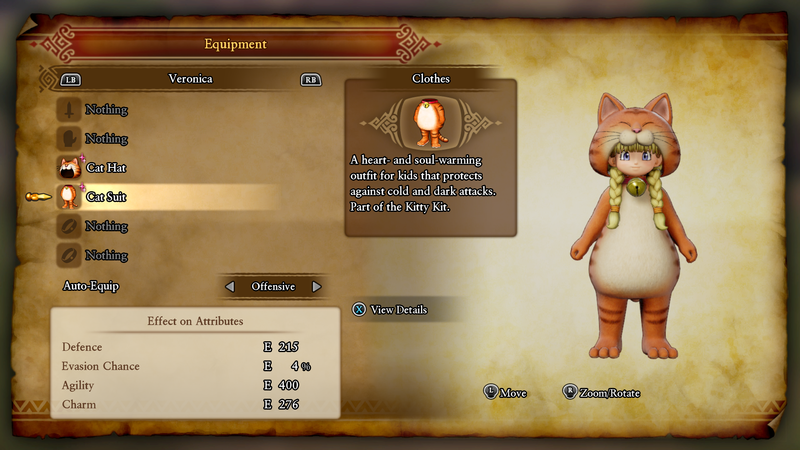 Finessence: Buy at Octagonia's item shop. Serpent's Souls: Can be stolen from Royal Reptiles at the Ruins of Dundrasil. Saint's Ashes: A common steal from Wight Kings under Octagonia, or trade 1 Mini Medal each at the Academie after filling out the stamp book. Mini Medals can be farmed from the Black Horse Race mini-game. Gold Bar: Buy this at the Trial Island shop. Spectralite: Buy this at the Trial Island shop. Hendrik's Armor: Before going into the Post-Game, you can get this from the competing shop stalls in Gondolia. During the Post-Game, you'll get this armor set automatically. Dragon Hide: Can purchase at Angri-La. Gold Nuglet: Buy from the shop at Trial Island. Evencloth: Buy at Snaerfelt Camp. Technicolour Dreamcloth: Buy from the shop at Trial Island. Pitch Pearl: Purchase from the stall to the left of the entrance of Lonalulu. Serpent Skin: Buy from the shop at Trial Island. Grubby Bandage: Can steal from multiple undead zombie type enemies such as Shadow Minister and Corpse Corporal. Wing of Bat: Can be stolen from multiple Drackmya or Succubat type enemies. Night Stick: Common steal from Malicious Brownie (Insula Incognito) or Horknight Watchman (Hotto Steppe). Drustan's Helm and Armour: Both of these are found in the Trial. 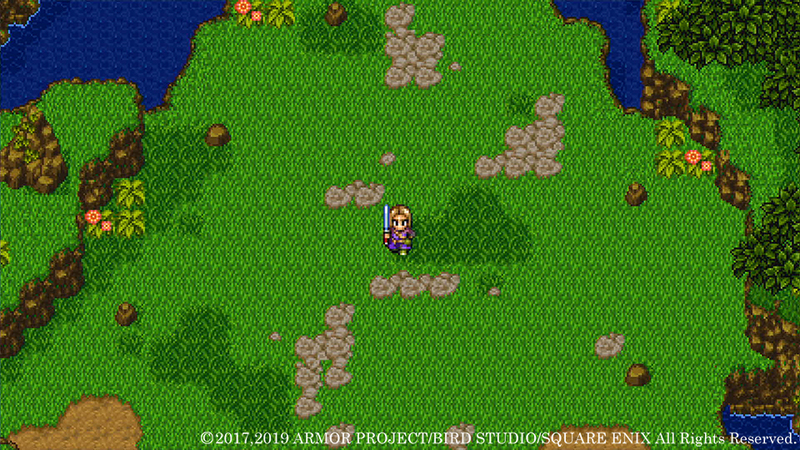 The Helm is found in the Eerie Valley area of the Disciple's Trial, while the armor is found in the first floor of the Luminary's Trial behind the red-sealed door.